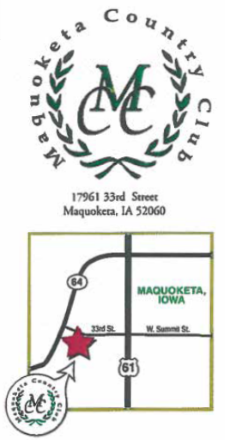 All non-member guests at the Maquoketa Country Club need to register for golf by signing in at the Clubhouse prior to playing golf. The bill may be paid by the guest or the member. All guests with a member and with a residence within a 20 mile radius of Maquoketa will be allowed to use the golf course up to three (3) times per calendar year. Members may bring guests to all club events, but must remember that some events count under the three (3) visit per year limit. Ladies Best Shot (Tuesdays), Men’s Best Shot (Thursdays), and the night Couples Golf Night events also count toward the three (3) visit per year limit. Exception: The Non-Profit Fundraisers and 18-Hole Tournaments do not count toward the three (3) visit per year limit. Members of other clubs outside the 20 mile radius can golf on Monday, Wednesday or Friday. All guests are subject to our regular green fees. Members may bring guests to the Bar & Lounge and our Swimming Pool as many times as they wish. This will allow members to more fully enjoy use of these facilities. This is not meant as a loophole for previous members or to potential members not wanting to pay a membership of their own. All guests are subject to regular pool fees. This is a privilege being extended to our members to fully utilize their membership. If the Board feels a guest is abusing a privilege, they will be notified and asked to join the Club or discontinue further visits. Guests of our Bar & Lounge and/or our Swimming Pool must be accompanied by a member at all times.